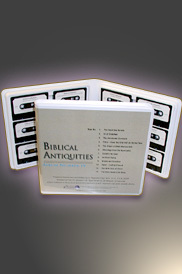 Biblical Antiquities IV is an album of 12 cassette tapes by E. Raymond Capt perfectly suited for radio programs as well as group or individual Bible studies dealing with among other intriguing subjects the Birth Date of Christ. The following titles describe the subject matter of Album IV. Ideal for radio programs group or individual Bible Study.